Last Friday, like this Friday was a cold and rainy day in London. By the time husband and I met up, it was raining pretty heavily and the wind was chilly. It felt like we were back in February right in the fag end of April. Since neither of us carry umbrellas (in our defence umbrellas most often turn in the wind and are pretty useless) we were steadily getting wet. It was a classic setting for a Friday evening about to turn sour. We started walking from Tottenham Court Road towards Soho. I wanted some warm and nourishing food, preferably Chinese. Husband wanted shelter. Now we are both Soho and Chinatown frequenters. We love checking out the various places in Soho. Chinatown is also a favourite. Not because the food is exceptional there. But since it is so conveniently located and I am perpetually in love with Chinese food & always craving it. Also these Chinese eateries are not very expensive. We have had some hits and some misses during our visits, but yet to find a place we are particularly keen to go back to. This time we entered Chinatown through the back lane, the lights were coming on, the eateries were all geared up for dinner. Some places were already full and bustling, some still awaiting diners. We passed some 4/5 places till we saw this one. 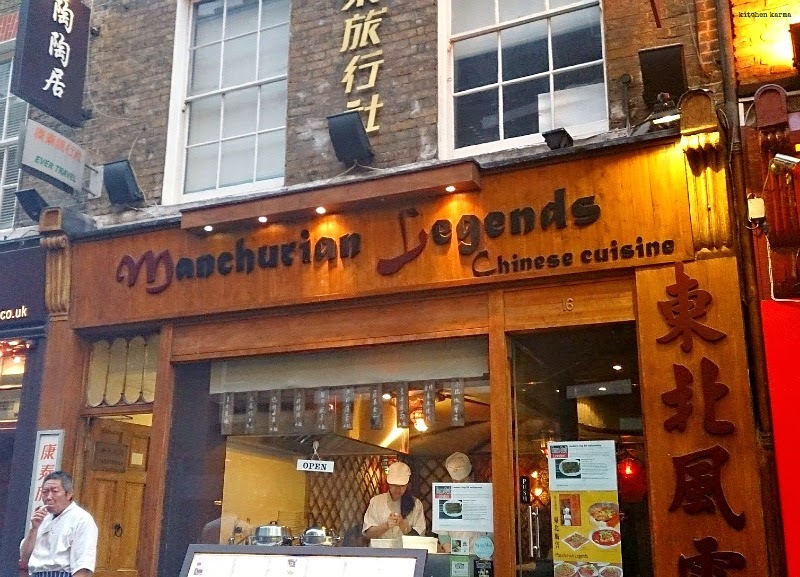 Manchurian Legends. The place looked semi full and the menu read intriguing. We walked in, it was almost pitch dark, but there was a nice bustle. We were shown to a table right at the end. Two thick volumes of menus came. I swallowed a little going through page after page of offal, intestine, gizzard, heart, tripe, blood cake, knuckle offerings. Now it maybe a paradise for some people, but if you follow this blog you would know that I am a pretty squeamish meat eater. I eat very selected meat and that too with great caution. While looking through the menu I was sure there must be other bits of meat in that list somewhere, just finding it was a challenge. Finally find it we did. The menu had a cold starter selection which we ignored. We wanted hot, steaming food. They also had dumplings, which I am generally a sucker for, but then we found the skewers. Meat skewers are a speciality of northern Chinese cuisine and not every eatery makes those. Since we found those here, we were not about to miss them. We ordered the skewers, pork belly, lamb and chicken, two of each. Then something happened to me, I just took off. I mean I just kept ordering food--chopped chilli fried rice, noodles with eggs and chives, double cooked pork belly with chillies, pan fried lamb with shallots and chillies and stir fried crab with chillies. All this food for just the two of us. I mean really, the waitress who was taking our order should have said something. Some little warning. None came, she took down the order with a straight face and left us. And then the food started coming. Plate after plate and very soon there was no space to keep the plates on the table anymore. Our tiny table was literally heaving. I did not enjoy the skewers that much. The lamb and pork ones were too fatty for my liking. And the chicken one was nothing to write home about. But my husband loved the pork and lamb ones. What I loved was the noodles and the lamb. The pan fried lamb was to die for. The noodles was very different from the usual fare and went really well with the lamb. We sent the pork, the crab and the fried rice to be packed for take-away. We had a proper lunch the next day with the left overs. That will give you an idea just how much I had over ordered. I did not enjoy the pork belly that much, but the fried rice and crab both were very good. Finally we have found a place in Chinatown that we want to go back to again. If you do visit do order with a bit of restraint. 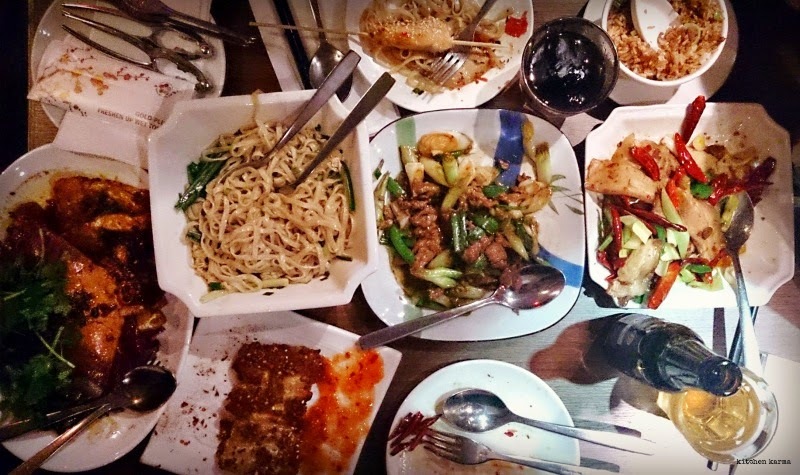 Best Chinese restaurants are in China towns; all kind of food you can find there. I like the fact that they use all parts of an animal for food.